I decided to take up today’s WordPress Daily Prompt: A genie has granted your wish to build your perfect space for reading and writing. What’s it like? From miles above the Earth my writing space cannot be seen, but I know it is there. You see, I create this space myself each time I sit down to the keyboard to write and because circumstances in my life change day to day and even moment to moment, the space changes too. Today as I zoom in to get a closer look, I see my room is in the United States on the eastern coast. Oceanside. 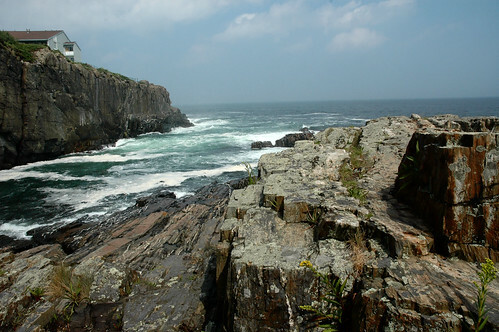 Right next to the water perched on a cliff with galloping waves racing toward a crashing explosion against the rocks. The year is still quite young–only February third–and it is quite cold way up north here by the sea. So we are inside, my husband and I. He doing his work and I, with my cup of coffee, am about to tend to mine. Come, let me show you one of my favorite spaces where magic is made! We will pass through the grand living room full of warm wood and sturdy stone. It’s such a welcoming place but it is for family activities and guests and hosting parties–not for my most solemn and private endeavor. Let’s go through the kitchen now. It’s beautiful isn’t it? I love all the cabinetry, my fine professional six-burner gas stove; I love how spacious and clean it all looks. Miles of counters, too! How do you like my pantry? It has space for everything and anything I want to keep on hand. And maybe when we’re through touring, I’ll show you my dish collection which I keep in these antique hutches. I love collecting all kinds of dishes and unusual serving items. So much fun! The kitchen is my practical laboratory where I create what I think is the most delicious food in the world. I love to put on my apron and see what’s in the pantry and refrigerator and go to town making something that is new and that we haven’t had before. I especially love this little area by the window because it affords just the right natural light to photograph my creations! I love my kitchen, but it isn’t where I write. It’s very close to the kitchen though. My writing space is just through this door. It’s a warm and cozy room off the back of my kitchen. One whole wall is nothing but windows looking out onto the cliffs and the ocean beyond. Sometimes you can see the faraway lighthouse on the horizon and once in a while you can watch sailboats gliding past on their way to the harbor several miles south. It’s too cold to go out there today, but in the summer there’s nothing better than opening the glass doors, sitting out on the deck, with my laptop on the little table, typing away to the rhythm of the rolling waves and sipping a cold lemonade or an iced tea. The opposite wall draws me in wintertime. There’s nothing like a roaring fire in that huge stone fireplace during a cold and gray February day! The crackling fire is so soothing and mesmerizing. See where my husband has built me a cast iron crane that holds this wonderful dutch oven cooking pot? Now that’s a cooking method! I guess you could call my writing room my library. After all, it is lined floor to ceiling with shelves of books. I have a lot of books! And this entire section here is cookbooks, and these are travel books, and over here is fiction, religion on this shelf–lots of categories. One of my favorite things is the heavy wood sliding ladder we built so I can reach any book on the shelf. Just like a real library! Have a seat on one of my over-sized cushiony chairs; they’re guaranteed to be comfortable. No doubt you’ll feel like Alice herself because sitting in this huge chair, the library shelves loom above and seem to go on forever. The chairs are big enough for an adult to curl up in or dangle the feet from. Everything in the room is comfortable–the warm lights, colors, textures and shapes that fill the spaces. I’ve collected these things from all over the world and enjoy each and every item and the memories they ignite! Ah yes! Here is my actual writing table. It is just a plain table with space for my keyboard and monitor and for maybe a coaster for a cup of something hot to drink. Nothing else. You don’t even see the computer, do you? No clock, no knick knacks, no papers. Just a plain table and my writing tools. No television in the library. No radio, no CD player. Those are all elsewhere. Here it is just my ocean, my fireplace, my writing tools. It’s just me and my thoughts, that is all. Those are the ingredients for writing today. This is the core. Ground zero. Couched within. The library plays a part in the space. The kitchen plays a part in the space. The deck, the house, the cliffs and the ocean play a part in the space. The cold February sky, the gracefully turning planet, the universe. I use them to help create the space. Though this is one of my favorite writing spaces, there are others. For tomorrow I may linger above the Earth and locate a desert spot–all pink and purple and green and cream and gray. 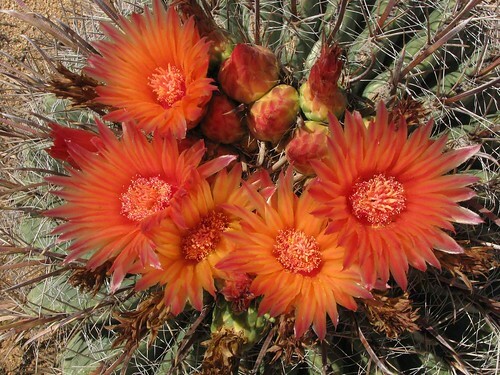 Perhaps my writing space will be in a tiny old Airstream and I will look out onto the desert and marvel at the huge desert sky and inspect the nuances of the barrel cactus flowers that surround my space. And I will again be free to write–just me, my tools and my thoughts. For you see I am my own genie and my writing space is my creation with endless possibilities. I am so lucky to know that! This entry was posted in Life, Lifestyle, Writing and tagged environment, genie, inspiration, magic, spaces, writing by mycookinglifebypatty. Bookmark the permalink. Tea with lemon and honey is served! Thanks Jack, and thanks for making me my fireplace dutch oven set-up! Just you watch. You’ll be creating and manifesting this exact space before you know it. You wrote so richly that I felt like I was there. Lovely, Patty. Why Kathy! You just come on in and enjoy my library writing space with me! I get us some hot chocolate! Can’t drink it for another 1 1/2 weeks, Patty. How bout a cup of tea with honey and lemon?